It’s been interesting to reflect on how my comic book reading habits have changed since I stopped collection comics in single issue format. There’s certainly some good along with the bad but mostly, I think it’s been a positive change. Some of the bad includes how I fell out of tune with recent comics. I’m not longer following the ups and downs of comic publishing on a monthly, or even weekly, basis. On the other hand, one of the positives has been that I spend less time chasing after and reading new comics and I’m able to focus more on acquiring and reading good (or at least interesting) comics, whether they’re new or old. For some readers this might sound a little silly. Why couldn’t I do both? Well when you consider that I’m an adult working in the modern world and I have responsibility and interests outside of comics, keeping up with monthly titles and having the opportunity to discover older and worthwhile works is a difficult thing for a person to do. The key thing to keep in mind though is that comics is but one of my interests. You just have to look at the archives of Shared Universe Reviews to see that I like reading novels, too and even though I don’t write a lot about movies, I really enjoy watching them. Before I quite the world of monthly comics, there were a few titles that I really enjoyed but I had to drop them when I changed my reading habits. I say “I had to” because cutting myself loose was a decision I made at the same time I moved to a different city. There were some series that I was leaving behind knowing I would return to them someday, mostly because I enjoyed them so much. Wonder Woman by Brian Azzarello, Cliff Chiang, and Tony Akins (SPELLING FOR ALL) is one of the series. I’m now trade waiting for this series and now that the third trade paperback volume has been released, I thought it’d be a good time to revisit the series. 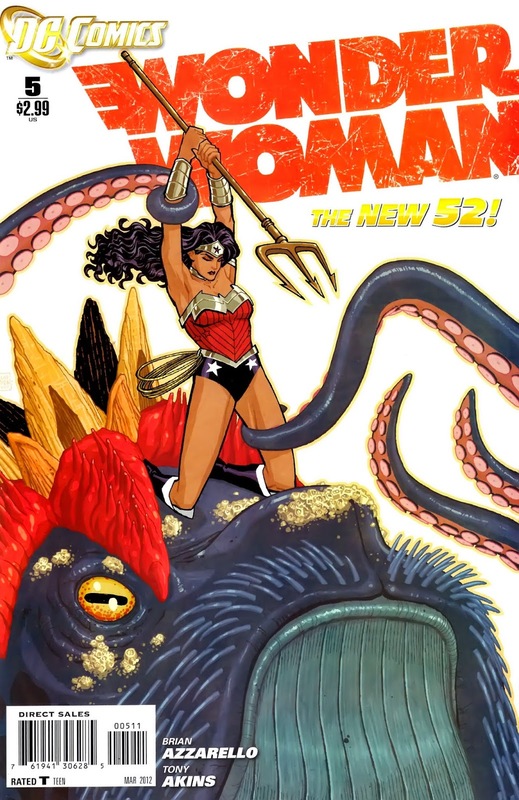 In the very first issue, heck the first few pages, this latest Wonder Woman reboot marks itself as a different take on the character. Characters from Greek mythology have long been a part of Wonder Woman’s stories but here they take on a new look and feel. Even Diana’s portrayal is influenced by how Azzarello integrates the Greek gods into the story. He pushes that angle of the story much farther than any incarnation of the character I’ve read before. It immediately makes this comic worth checking out, not necessarily because it’s different but because the differences that Azzarello weaves into Wonder Woman make it an intriguing story. Overall, these first six issues are about family and an individual’s identity within that particular social construct. It’s made more complex (or complicated, take your pick) by the fact that most of these characters are gods or demi-gods. The comic begins shortly after a young woman, Zola, has slept with Zeus. She is attacked by a couple of centaurs and after being rescued by Wonder Woman and Hermes, she finds out that she’s pregnant. The centaurs that attacked her where sent by Hera, Zeus’s wife and queen of Olympus. Angered by her husband’s latest infidelity she’s determined to put an end to the pregnancy before the child is ever born, even if it means killing Zola. Wonder Woman is determined to protect the child and in doing so she gets pulled into the family drama of the gods, learning disturbing secrets along the way. Meanwhile, Zeus has disappeared. His unexplained absence has put in motion some familial politics and some of his children vie for the throne of their father. One of the interesting things about this latest Wonder Woman series is how it compares to previous versions of the character. It’s very interesting but also very different from the Wonder Woman comics I’ve read before. Azzarello is taking advantage of the New 52 reboot of the DC Universe to create a story that is unencumbered by continuity and previous incarnations of the character. I agree with his decision to do so, especially because it’s a choice that seems encouraged by DC’s line wide relaunch. I’m also the kind of fan that doesn’t get too upset when continuity changes take place. Superhero comics books are part of a shared universe and even if creators and editors worked together to maintain consistency throughout years of publishing, it would be impossible to do for a character as old as Wonder Woman in a shared universe as old and as complicated as DC Universe pre (and even post) New 52. Even in the relaunched series, of which several are coming up on their third year anniversaries, there have been some pretty serious inconsistencies between series that use the same characters. Wonder Woman is one of those characters, where how she’s portrayed in her solo title doesn’t match up with her appearance in other books, like say Justice League. Even with the books where continuity seems to matter it’s a mess so why not choose to ignore it for the most part and focus on telling an interesting story? I say kudos to the creators of the New 54 Wonder Woman for making a smart storytelling decision. Really the best thing about this book for me is how Azzarello embraces the aspects of Wonder Woman’s previous mythology and its reliance on Greek myths. Instead of having Greek mythology as part of Wonder Woman’s mythology, he makes her a part of theirs. It’s a nice perspective and it’ll likely provide a lot of potential for future stories. For now the fun is limited to meeting members of the pantheon, such as Hermes, Apollo, Poseidon, Hera, Hades and a few others. I also appreciate this kind of approach because it doesn’t feel like he’s trying to shoehorn the Greek gods into a comic book story, instead he’s allowing this far older and in my (and I would imagine most everybody’s) opinion, better mythology, to raise Wonder Woman’s story to a new level. It’s also surprising just how familiar yet mysterious the gods can be in these first few issues. Chiang has done some really interesting characters designs and obviously some are better than others. My favourite is probably Hermes but I did get a kick out of seeing Ares being based on Azzarello himself. I enjoyed this issues a bit more the second time around but the constant, and often not all that clever, wordplay is tedious. I think it bothers because most of it is part of the characters dialogue and it sounds really awful. Thankfully the sub-par dialogue doesn’t take too much away from the rest of the comic. Without any doubt, Wonder Woman was, and is, one of my favourite titles from the New 52.